The World Bank Group (WBG) (French: Groupe de la Banque mondiale) is a family of five international organizations that make leveraged loans to developing countries. It is the largest and most well-known development bank in the world and is an observer at the United Nations Development Group. The bank is based in Washington, D.C. and provided around $61 billion in loans and assistance to “developing” and transition countries in the 2014 fiscal year. The bank’s stated mission is to achieve the twin goals of ending extreme poverty and building shared prosperity. Total lending as of 2015 for the last 10 years through Development Policy Financing was approximately $117 billion. Its five organizations are the International Bank for Reconstruction and Development (IBRD), the International Development Association (IDA), the International Finance Corporation (IFC), the Multilateral Investment Guarantee Agency (MIGA) and the International Centre for Settlement of Investment Disputes (ICSID). The first two are sometimes collectively referred to as the World Bank. The World Bank’s (the IBRD and IDA’s) activities are focused on developing countries, in fields such as human development (e.g. education, health), agriculture and rural development (e.g. irrigation and rural services), environmental protection (e.g. pollution reduction, establishing and enforcing regulations), infrastructure (e.g. roads, urban regeneration, and electricity), large industrial construction projects, and governance (e.g. anti-corruption, legal institutions development). The IBRD and IDA provide loans at preferential rates to member countries, as well as grants to the poorest countries. Loans or grants for specific projects are often linked to wider policy changes in the sector or the country’s economy as a whole. For example, a loan to improve coastal environmental management may be linked to development of new environmental institutions at national and local levels and the implementation of new regulations to limit pollution. The World Bank has received various criticisms over the years and was tarnished by a scandal with the bank’s then President Paul Wolfowitz and his aide, Shaha Riza, in 2007. The WBG came into formal existence on 27 December 1946 following international ratification of the Bretton Woods agreements, which emerged from the United Nations Monetary and Financial Conference (1–22 July 1944). It also provided the foundation of the in 1951, responsible for the preparation and evaluation of the World Development Report. Commencing operations on 25 June 1946, it approved its first loan on 9 May 1947 (US$250M to France for postwar reconstruction, in real terms the largest loan issued by the Bank to date). Non-members are: Andorra, Cuba, Liechtenstein, Monaco, State of Palestine, Vatican City, Taiwan, and North Korea. Together with four affiliated agencies created between 1957 and 1988, the IBRD is part of the World Bank Group. The Group’s headquarters are in Washington, D.C. It is an international organization owned by member governments; although it makes profits, these profits are used to support continued efforts in poverty reduction. Technically the World Bank is part of the United Nations system, but its governance structure is different: each institution in the World Bank Group is owned by its member governments, which subscribe to its basic share capital, with votes proportional to shareholding. Membership gives certain voting rights that are the same for all countries but there are also additional votes which depend on financial contributions to the organization. The President of the World Bank is nominated by the President of the United States and elected by the Bank’s Board of Governors. As of 15 November 2009 the United States held 16.4% of total votes, Japan 7.9%, Germany 4.5%, the United Kingdom 4.3%, and France 4.3%. As changes to the Bank’s Charter require an 85% super-majority, the US can block any major change in the Bank’s governing structure. The term “World Bank” generally refers to just the IBRD and IDA, whereas the term “World Bank Group” or “WBG” is used to refer to all five institutions collectively. On February 1, 2019 Kristalina Georgieva became acting president. On April 5, 2019 David R. Malpass was selected as the 13th World Bank Group President; his term began on April 9, 2019. Managing Director of The World Bank is responsible for organizational strategy; budget and strategic planning; information technology; shared services; Corporate Procurement; General Services and Corporate Security; the Sanctions System; and the Conflict Resolution and Internal Justice System. The present MD assumed the office after Sri Mulyani resigned from the post to take the charge as finance minister of Indonesia. The Independent Evaluation Group (IEG) (formerly known as the Operations Evaluation Department (OED)) plays an important check and balance role in the World Bank. Similar in its role to the US Government’s Government Accountability Office (GAO), it is an independent unit of the World Bank that reports evaluation findings directly to the Bank’s Board of Executive Directors. is the Director-General, Evaluation, whose evaluations provide an objective basis for assessing the results of the Bank’s work, and ensuring accountability of World Bank management to the member countries (through the World Bank Board) in the achievement of its objectives. After longstanding criticisms from civil society of the Bank’s involvement in the oil, gas, and mining sectors, the World Bank in July 2001 launched an independent review called the Extractive Industries Review (EIR – not to be confused with Environmental Impact Report). The review was headed by an “Eminent Person”, Dr. Emil Salim (former Environment Minister of Indonesia). Dr. Salim held consultations with a wide range of stakeholders in 2002 and 2003. The EIR recommendations were published in January 2004 in a final report entitled “Striking a Better Balance”. The report concluded that fossil fuel and mining projects do not alleviate poverty, and recommended that World Bank involvement with these sectors be phased out by 2008 to be replaced by investment in renewable energy and clean energy. The World Bank published its Management Response to the EIR in September 2004. following extensive discussions with the Board of Directors. The Management Response did not accept many of the EIR report’s conclusions. However, the EIR served to alter the World Bank’s policies on oil, gas and mining in important ways, as has been documented by the World Bank in a recent follow-up report. One area of particular controversy concerned the rights of indigenous peoples. Critics point out that the Management Response weakened a key recommendation that indigenous peoples and affected communities should have to provide ‘consent’ for projects to proceed – instead, there would be ‘consultation’. Following the EIR process, the World Bank issued a revised Policy on Indigenous Peoples. Over the past 15 years, the World Bank’s policy on disclosing information has evolved gradually. Until now, the World Bank’s approach has been to spell out what documents the World Bank discloses. The new World Bank Policy on Access to Information effective 1 July 2010, is a pivotal shift in the World Bank’s approach to making information available to the public. Under the new policy, the World Bank will disclose any information in its possession that is not on a list of exceptions. This policy positions the World Bank as a leader in transparency and accountability among international institutions. The World Bank is a major source of funding for combating AIDS in poor countries. In the past six years,[year needed] it has committed about $2 billion through grants, loans, and credits for programs to fight HIV/AIDS. In Masters of Illusion: The World Bank and the Poverty of Nations (1996), Catherine Caufield argues that the assumptions and structure of the World Bank operation ultimately harms developing nations rather than promoting them. In terms of assumption, Caufield first criticizes the highly homogenized and Western recipes of “development” held by the Bank. To the World Bank, different nations and regions are indistinguishable, and ready to receive the “uniform remedy of development”. The danger of this assumption is that to attain even small portions of success, Western approaches to life are adopted and traditional economic structures and values are abandoned. A second assumption is that poor countries cannot modernize without money and advice from abroad. Criticism was also expressed towards the IFC and MIGA and their way of evaluating the social and environmental impact of their projects. Critics state that even though IFC and MIGA have more of these standards than the World Bank they mostly rely on private-sector clients to monitor their implementation and miss an independent monitoring institution in this context. This is why an extensive review of the institutions’ implementation strategy of social and environmental standards is demanded. The World Bank’s Integrity Vice Presidency (INT) is charged with investigation of internal fraud and corruption, including complaint intake, investigation and investigation reports. The Compliance Advisor/Ombudsman (CAO) criticized a loan given to the palm oil company Dinant by the World Bank after the 2009 Honduran coup d’état. There have been numerous killings of peasants in the region where Dinant was operating. ^ “About the World Bank”. worldbank.org. ^ a b c “Member Countries”. World Bank Group. Retrieved 3 June 2016. ^ “David Malpass, a US Treasury official and Donald Trump’s pick, appointed World Bank president”. scroll.in. Retrieved 6 April 2019. ^ “World Bank Group Leadership”. worldbank.org. ^ “Board of Directors”. Web.worldbank.org. Retrieved 31 May 2010. ^ “Banque mondiale”. Retrieved 25 October 2017. ^ “UNDG Members”. United Nations Development Group. Archived from the original on 13 October 2013. Retrieved 27 May 2012. ^ “2015 Development Policy Financing Retrospective – Results and Sustainability”. worldbank.org. ^ World bank – structured financial products (PDF). Washington: World bank. 5 April 2016. Retrieved 5 November 2018. ^ “Wolfowitz May Not Survive World Bank Scandal Involving Girlfriend’s Promotion, Pay Hike”. Foxnews.com. 12 April 2007. Retrieved 15 February 2014. ^ FAQ-About The World Bank, Worldbank.org. ^ The United Nations system: Principal Organs, Colorado.edu. ^ a b c d e f “About Us”, wordbank.org, accessed 30 May 2007. ^ US Blocks Stronger African Voice At World Bank Retrieved 7 August 2007. ^ “More Chinese at helm of international organisations”. The Straits Times. Retrieved 3 October 2018. ^ “Indonesia’s president appoints World Bank’s Sri Mulyani as finance minister”. The Star. Retrieved 3 October 2018. ^ “Striking a Better Balance”, worldbank.org, January 2004, accessed 30 May 2007. ^ “Striking a Better Balance”, “World Bank Group Management Response” to “The World Bank Group and Extractive Industries: The Final Report of the Extractive Industries Review: World Bank Group Management Response”,17 September 2004, accessed 30 May 2007. ^ “Oil, Gas, Mining, and Chemicals” (follow up report), accessed 30 May 2007. ^ “The Energy Tug of War”, The New Internationalist, No. 373 (November 2004), accessed 30 May 2007. ^ “World Bank Operational Manual: Operational Policies: Indigenous Peoples” (Op 4.10), worldbank.org, July 2005, accessed 30 May 2007. ^ “Access to Information”. Worldbank.org. Retrieved 27 May 2012. ^ The World Bank Global HIV/AIDS Program, The World Bank’s Global HIV/AIDS Program of Action (Washington, D.C.: International Bank for Reconstruction and Development/The World Bank, 2005), online posting, worldbank.org/aids, accessed 30 May 2007. ^ a b See Joseph Stiglitz, , Globalization and Its Discontents, and Making Globalization Work. ^ “Microsoft Word – IFI Watch Bangladesh_Vol_1 No_1.doc” (PDF). Retrieved 31 May 2010. ^ Korinna Horta (February 2013). “Most relevant review”. dandc.eu. ^ “Integrity Vice Presidency – The Investigative Process”. Web.worldbank.org. Retrieved 27 May 2012. ^ a b c Mychalejko, Cyril. 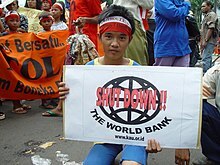 “Beyond Reform: It’s Time to Shut Down the World Bank”. Upside Down World. Retrieved 5 April 2014. ^ Malkin, Elisabeth (10 January 2014). “World Bank Is Criticized for Honduran Loan”. The New York Times. Retrieved 5 April 2014. ^ “World Bank Executive Directors Directory”. Bank Information Center.